An artist inspired by the natural world around her, Judith Schubert Mullen has gone out of her way to share this interest with art enthusiasts and students following her graduation from the School of the Art Institute of Chicago. The majority of her paintings are composed using oil, acrylic and enamel paints on canvas or paper, although several of her recent professional experiences -- coordinating "family week" at the Ox-Bow School of Art, a mosaic garden and a mural painting -- have expanded this repertoire. Her pieces have garnered critical attention in exhibitions including the Chicago Art Open; the Women's Work Exhibition in Woodstock, Illinois; Works on Paper at Louisiana State University; and Spectrum of Solutions at Parsons in Chicago. 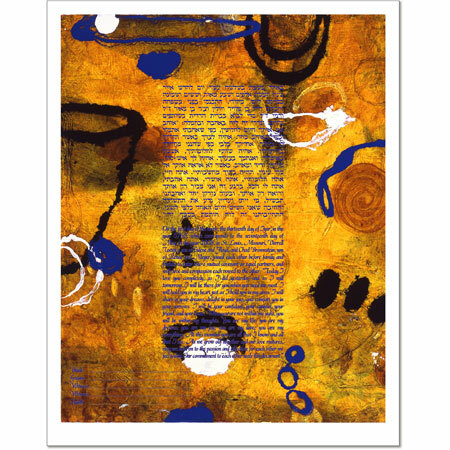 Her work was also recently featured in the Her Mark 2004 Date Book, produced by the Woman Made Gallery of Chicago, Illinois. Additionally, Judith has received numerous awards and grants, such as a Professional Artist Residency at Ox-Bow School of Art in Saugatauk, Michigan; the Spectrum of Solutions Award from AT Kearney; the U.S.A. Presidential Award from Nippon Steel of Chicago; and the Zanzi and Merit scholarships from Ox-Bow and the School of the Art Institute of Chicago, respectively. 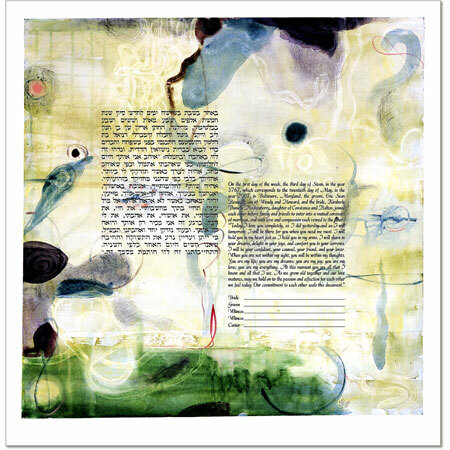 See all ketubah designs by Judith Mullen.